by George W. Bullard Jr. Chalice Press, 2005. There are a lot of books about church growth and church health, but few about what it means for a church to live to their potential. This book is one that is about the latter. It’s about churches discovering their potential and preparing for a spiritual strategic journey toward realizing their potential. Author, George Bullard, drawing from more than four decades of church leadership, explains the process of how churches can begin the journey of becoming all that God desires for them to be and do. Bullard, a Ministry Partner and Strategic Leadership Coach for The Columbia Partnership, outlines how congregations discover their unique potential, prepare for it, navigate the journey, identify issues that hinder them and recognize the natural life cycle and stages of congregational development. 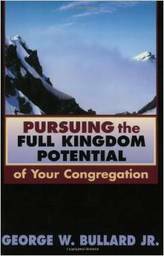 Through explaining how pastors, leaders and laity can tell the story of their desired future, this book will help them realize it. It is practical and inspirational, as well as deep and insightful. This book is especially helpful for congregations who are in transition, stymied by a lack of growth, who lack vitality or are preparing to engage in a strategic planning process.